I've got a new motto: Forget the laundry, it's Washi Day! And they're NEW in the shop. 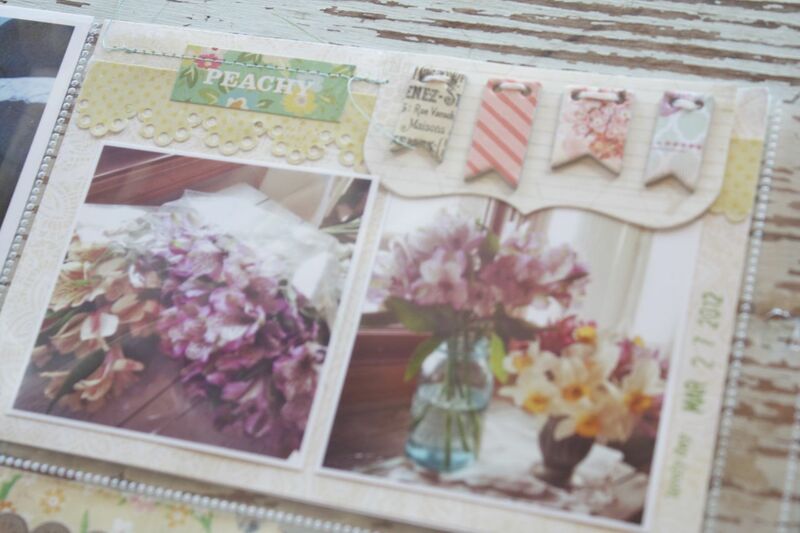 Limited quantities this time but if you love them, I'll keep them coming! I've also added some notebooks, a favorite for Mother's Day gifts. 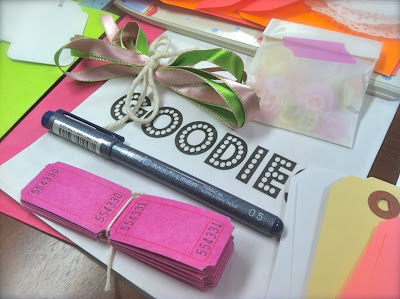 And there's a few styles of Goodie Bags, perfect for Summer when you need to entertain the wee little ones. Jordan's 8th grade graduation is coming up and she has 3 best friends, The Wolf Pack as they've been nick named. I thought it would be fun to make them all a fun graduation card with a photo. 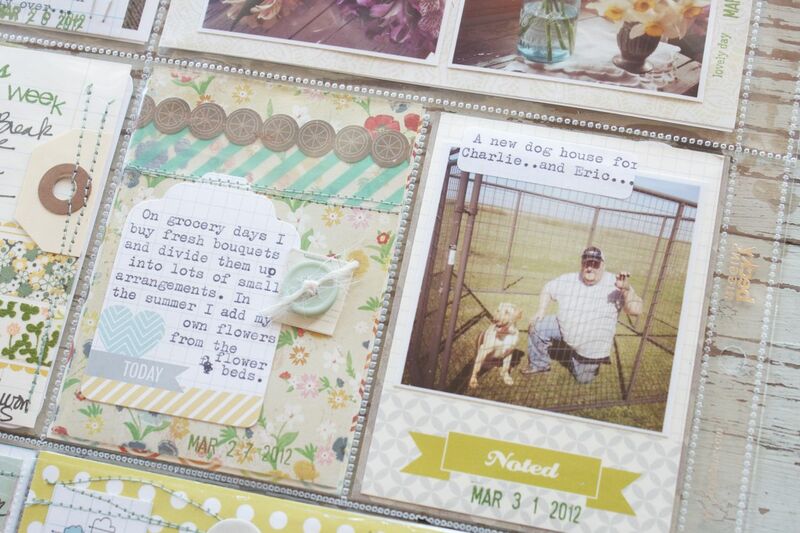 Studio Calico's frame stamps and mini Instagrams just go together like peanut butter & jelly. 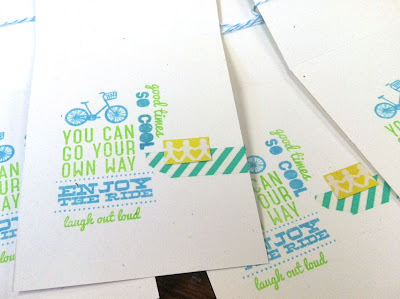 Here's my card I made (x 4)...and I thought it would be fun to give a little photo tutorial of my process. I started out without really having a plan or a card sketch in mind. I just knew that I wanted to start with these frames. The chosen class colors are turquoise & silver so I dug in my embossing drawer for those colors. Oh how I love to see these frames embossed. I trimmed around them closely and rounded the corners. 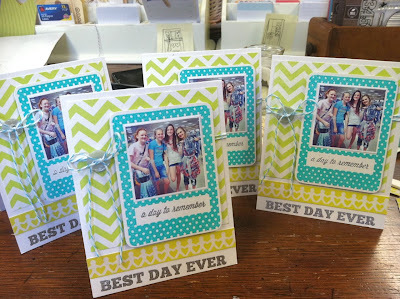 I also embossed the SC sentiment "best day ever" on the card front which is Papertrey Rustic White. 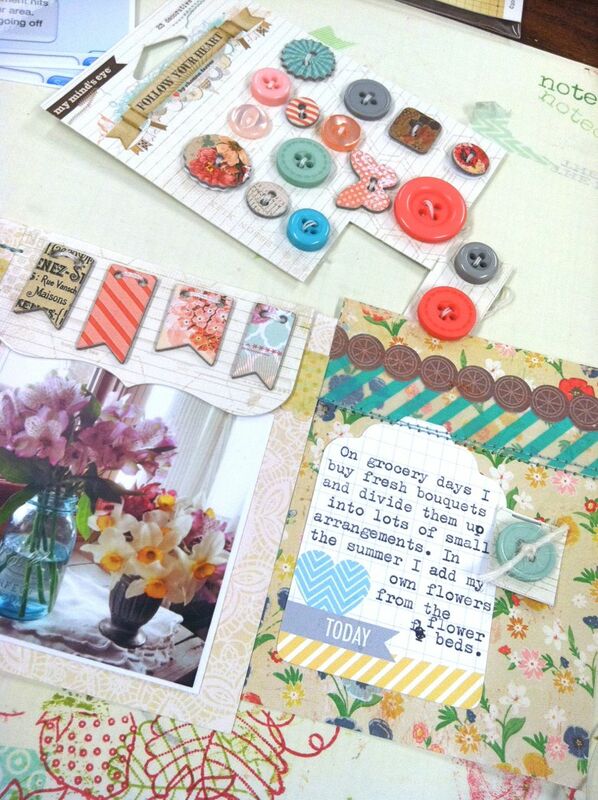 Next up I planned a layout and chose some patterned papers. 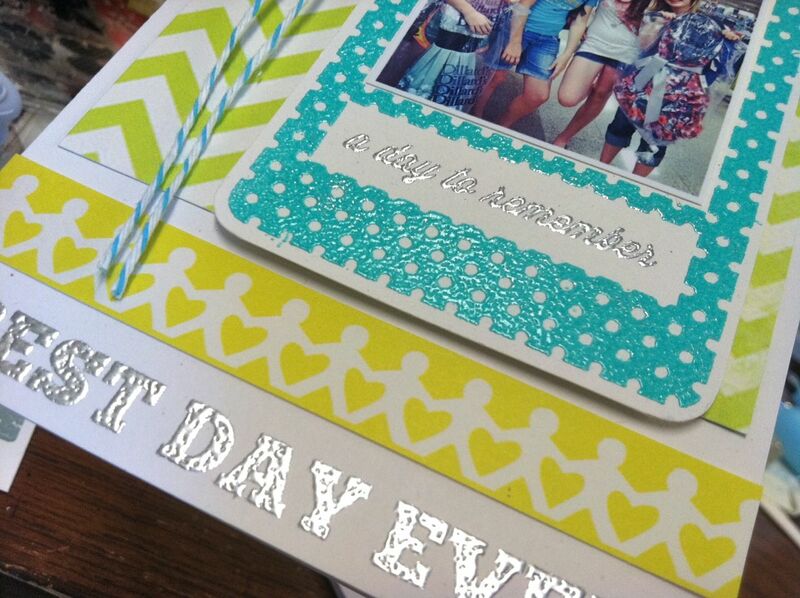 The chevron is from My Mind's Eye and the people paper chain is from Studio Calico. 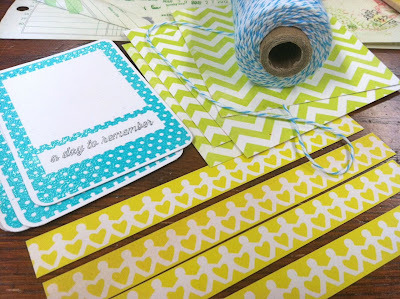 I also chose some aqua twine to coordinate. 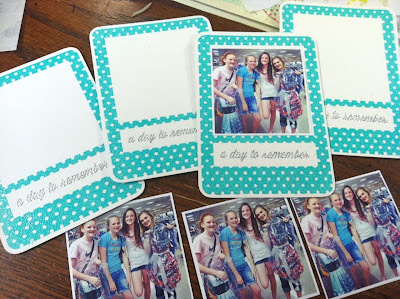 I assembled all the cut pieces on my 4 card fronts and added pop dots to the backs of the embossed frames. Next I printed a recent photo of the girls from their graduation dress shopping day. 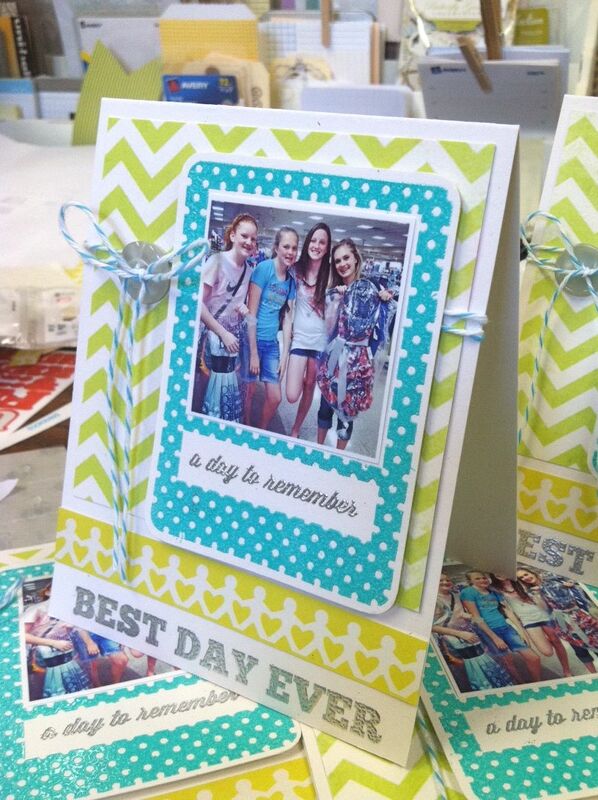 Teens love their photos of friends so I know the girls will appreciate these cards. I just reduced the size of a square Instagram in my printer settings and printed 2 photos on one 4 x 6 piece of photo paper. Ack, so cute! 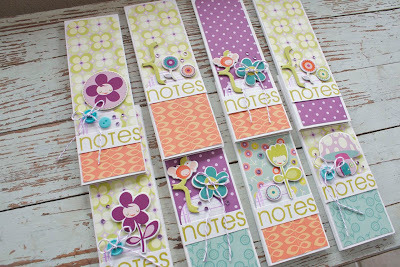 I did a little final assembly, adding Papertrey buttons, tied twine and Studio Calico wood asterisks to the card fronts. So many fun, colorful details and the embossing just makes everything bright and cheery. On the insides I used several stamps to create a collage of sentiments. 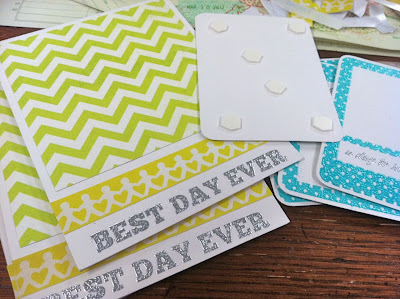 A little Washi tape and some leftover paper scraps finish them off. And here's the final four cards. I can't wait to hand them out to the Wolf Pack on graduation night. We have no kids tonight which is rare. We went out for dinner at a new Mexican restaurant. No margaritas. NO MARGARITAS. What's the point, right? So we thought we'd stay and have chips and dinner. No free chips & salsa. Say what? We enjoyed our time together then came home and stared at the wall and played with Charlie. Now Eric's watching tv in bed and I'm writing a blog post & drinking a cup of coffee. We are exciting people, people. Please go somewhere and have a margarita for me. Week 13 of Project Life took for-everrr! It was either going to be completed yesterday or left in the dust. I got it done. And with April nearly gone and May on its way I am boldly reminded how these are the months that I get behind. 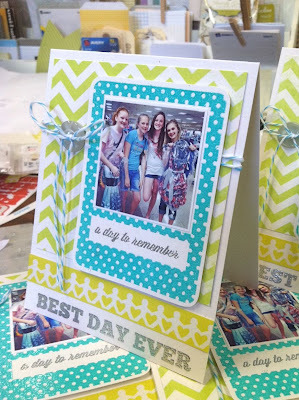 So many fun activities but real time suckers when it comes to creative time down in the Craft Department. Here we go. My 2 page spread. 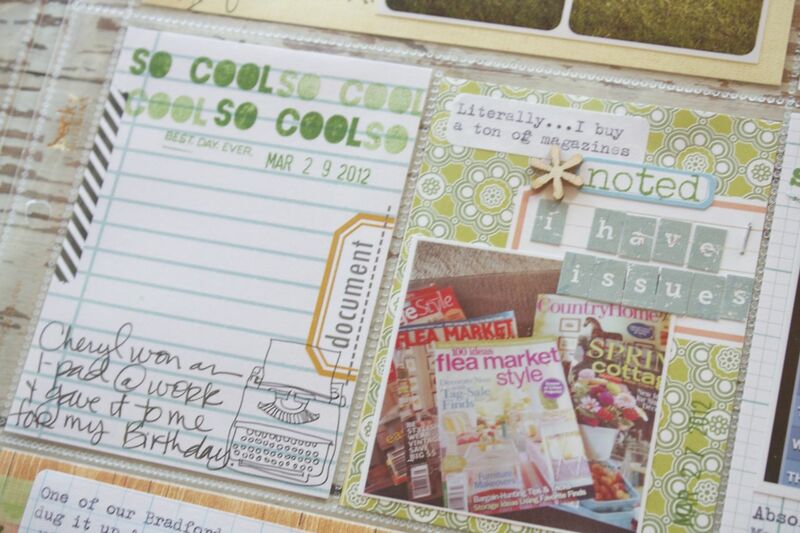 No inserts this week although I did a fun flipper insert + a pocket to accommodate some extra "stuff". 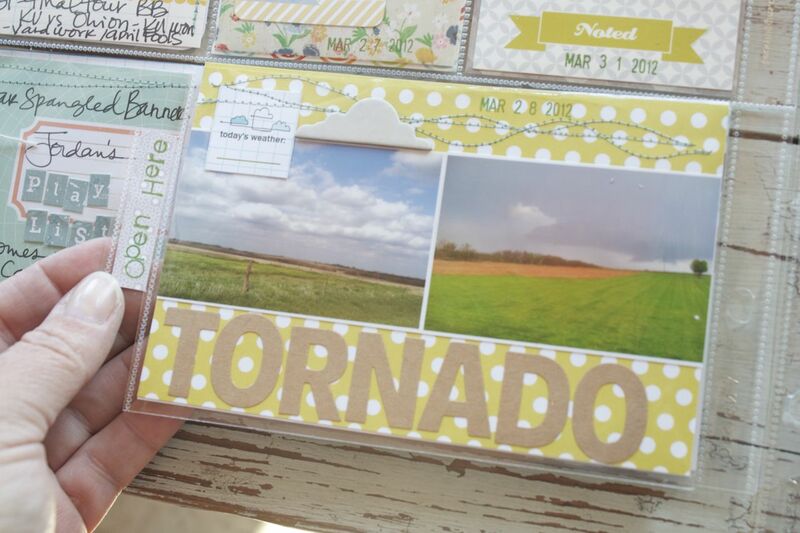 Back to school from Spring Break, more outdoor activities with the warmer weather, track meets and a tornado to boot. Lots of blues and green this week to go with the blue skies and green grass. 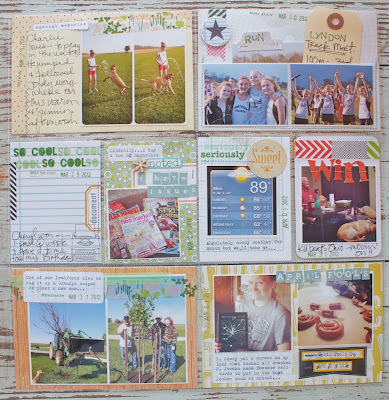 My 3 x 4 journaling inserts. Charlie wondered what the heck was going on once Spring Break was over. Monday stamp is from Studio Calico. 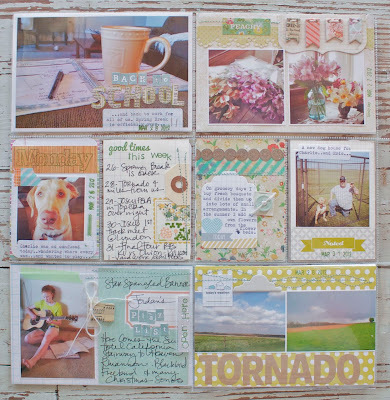 Week in Review on the right with Studio Calico good time stamp, Hero Arts letters, tag and Washi tape. 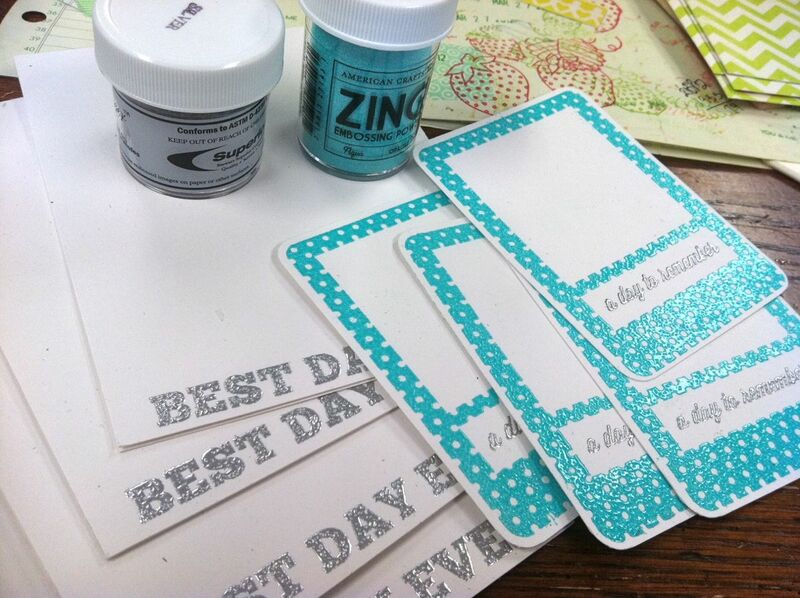 Patterned paper from Crate Paper, Washi tape from Studio Calico kit, Banana Fish Studio tag, and typed on label. 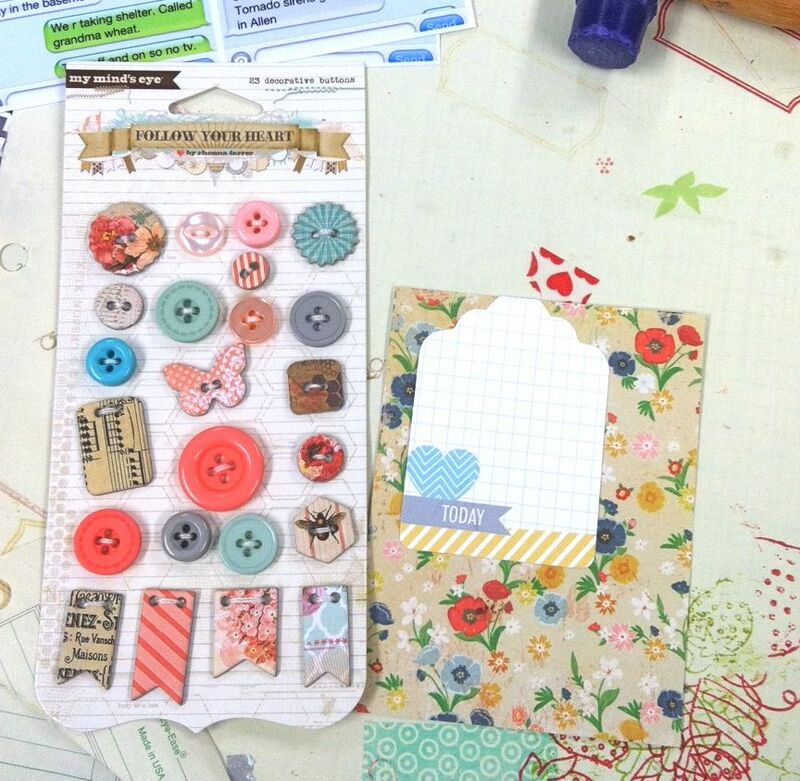 Stamps from Studio Calico set + Evalicious journaling card + Studio Calico patterned paper & letter stickers + wood asterisk. I still need to add a photo of my new Ipad in there too. 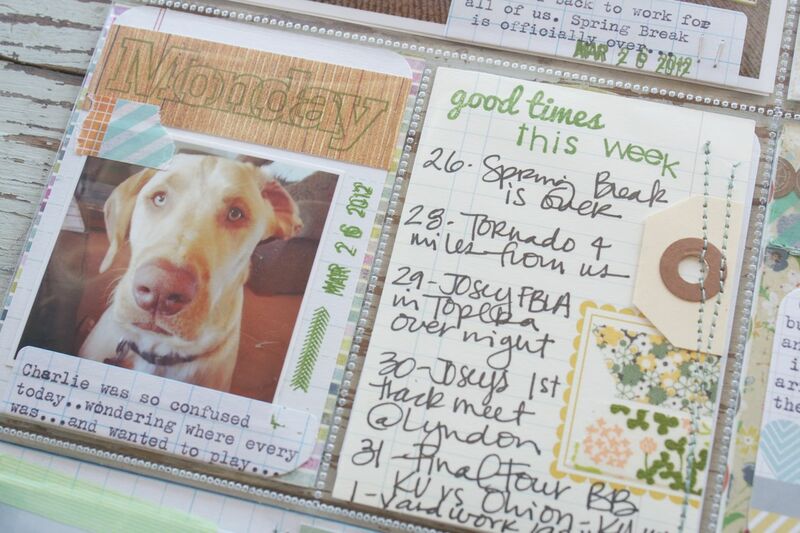 I also used lots of the Dear Lizzy date stampers this week. So fun! I loved the play on words with the "I have issues" cards that shows all my magazines. More Studio Calico stamps + Washi Tape and letters from my SC kit. Crazy temps and watching the KU basketball game with the family. 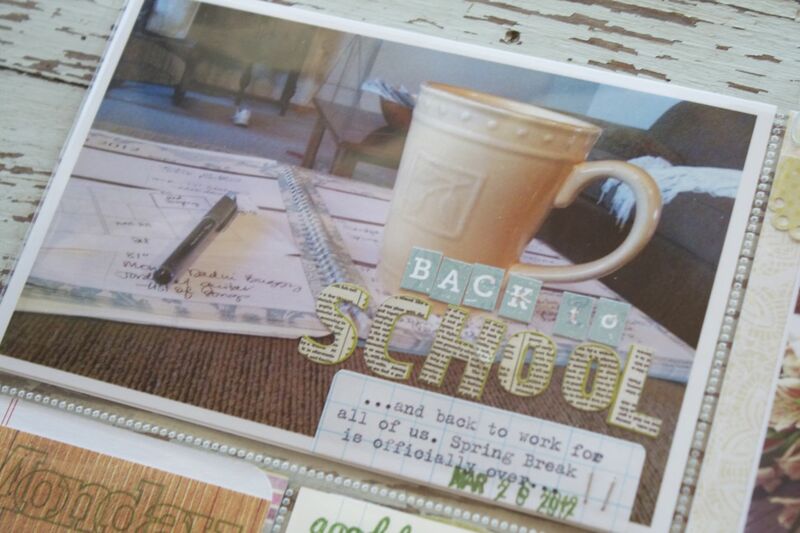 Sticker letters directly on the 4 x 6 photo insert along with a grid label that I ran through my vintage typewriter. Pretty flowers from the grocery store transformed into pretty bouquets for the house. And I had some fun uses for the My Mind's Eye button card from the SC Versailles kit. Can you spy what I did....here and few other places? I'll show you in more detail in an upcoming post. Jordand and her guitar. Always practicing and playing a little tune. 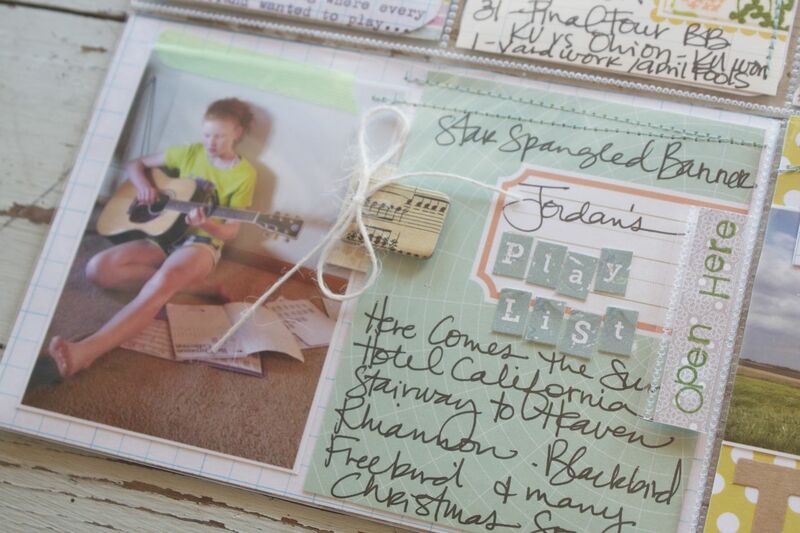 I jotted down some of her songs she's learned on a journaling card I cut from the Studio Calico Cubicle paper. Is this awesome or what? I need like 20 more sheets of this. 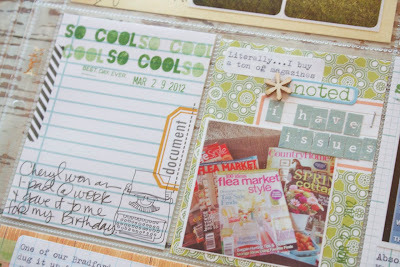 And here's the most creative part of this week's spread. I made a 4 x 6 flipper for this slot. We had a tornado warning while Eric was at a school board meet 15 miles away. 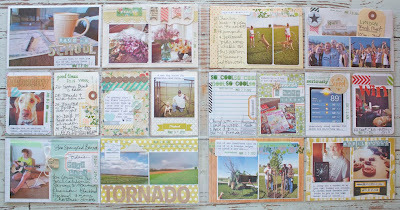 My tornado phobia kicked into high gear and it was a scary night. I used a 6 x 12 page protector for the top flipper part. The tap on the left is the spine of the insert that has the holes. I just snipped off enough to create a pull tab. And here's the flipper part when opened. The top part is the back side of the above photo with small Instagram photos and journaling. 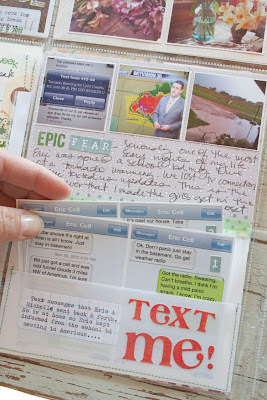 For the bottom I stitched on a vellum pocket and inserted 2 sheets of text messages. Eric was texting me weather updates all evening because he had tv service where he was and we didn't because of the high winds. I used another grid label to stick on some typewriter journaling onto the pocket. I used Washi to create the fold of the two pieces. I created another vellum pocket for this insert which all slips into the page protector slot. The two small photos are adhered to the pocket front & another photo with stamped tab and a medium tag with Josey's stats are tucked into the pocket. Chipboard button is from Banana Fish Studio. 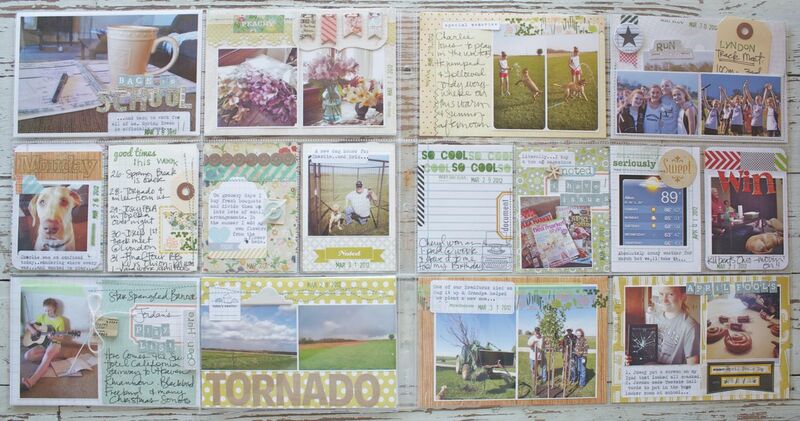 Another insert with typed grid label and washi tape. 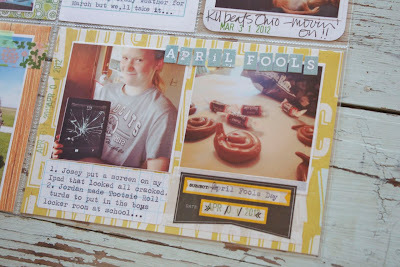 And lastly April Fool's Day. Josey and Jordan both had a few tricks up their sleeves. And that's it for today. 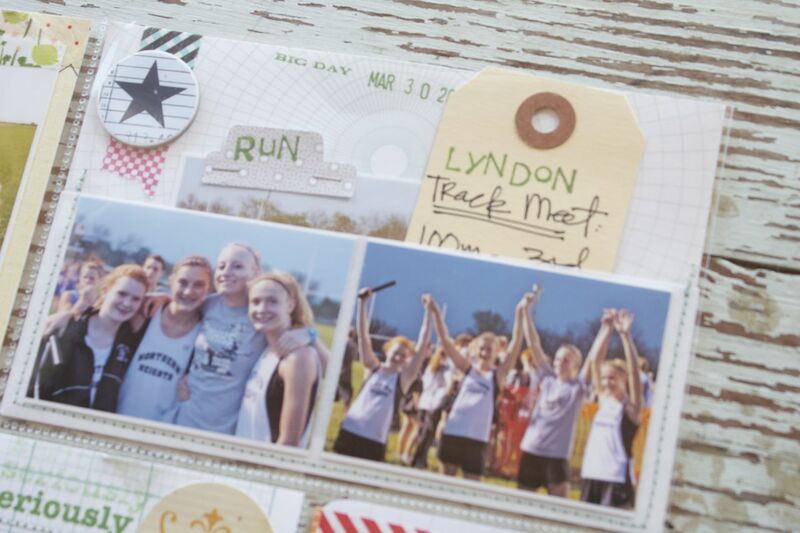 I've got a list a mile long of things to do for track meets, graduations, prom night, Mother's Day, the garden, family reunions and upcoming kits for the shop. Wow, April/May are crazy months, right? 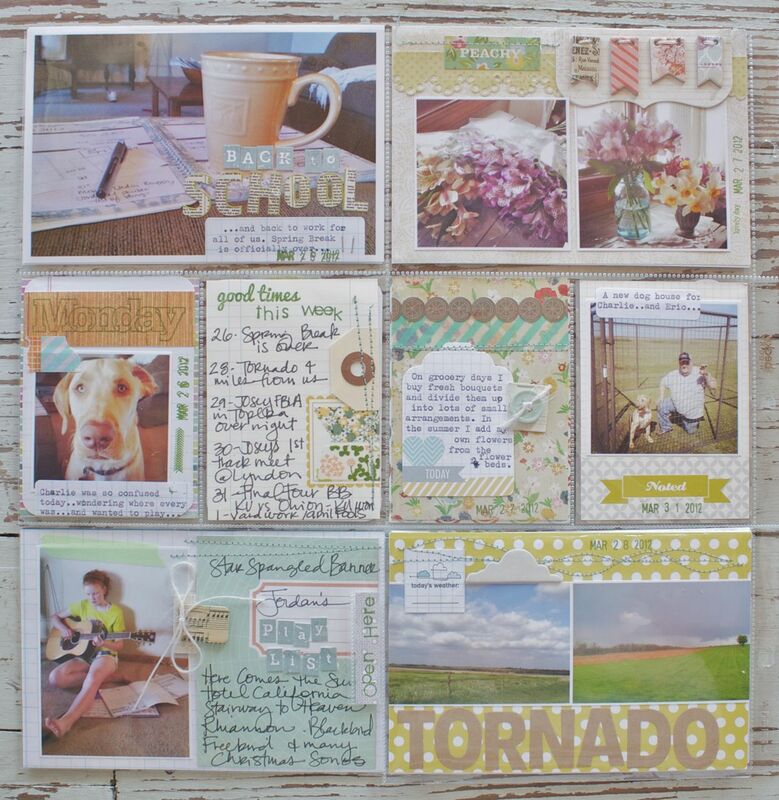 Coming soon: Some fun ideas of how to use those My Mind's Eye button cards, a graduation card tutorial and some garden ideas for some recent junk finds. Stay tuned. 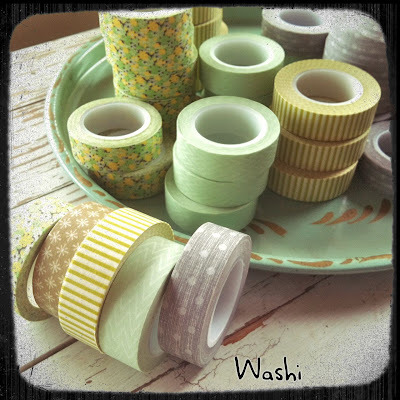 I have just started hearing about Washi Tape from Marcy Penner's blog ... and can't wait to try it out. Thanks to everyone for playing along and providing some great links. When time allows I'd love to link up all the great projects into one awesome Washi tape post! TGIF friends! 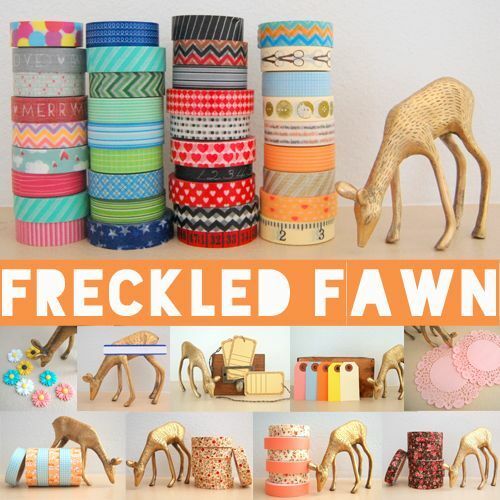 I'm excited to announce that soon I'll be adding some fun new Washi tapes from Freckled Fawn to my shop and special kits. 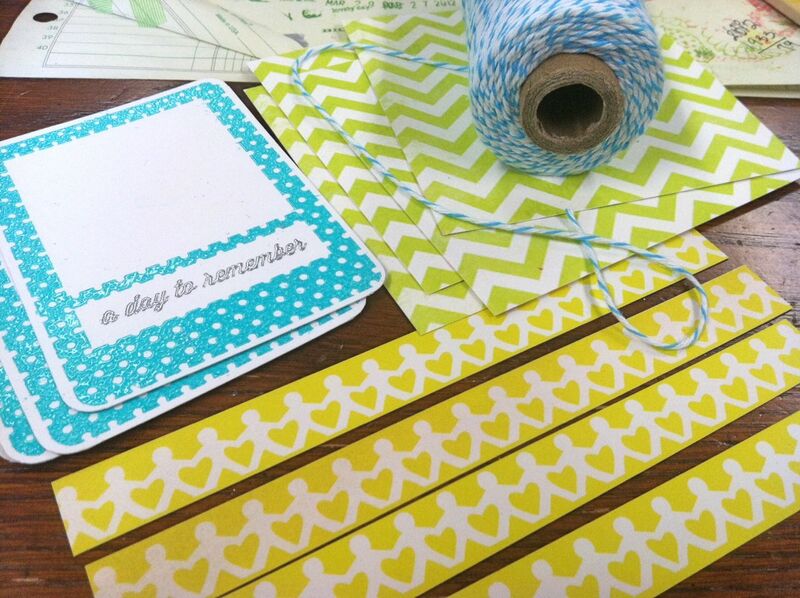 Washi tape is such a fun embellishment right now so I'm looking forward to this fun new addition. 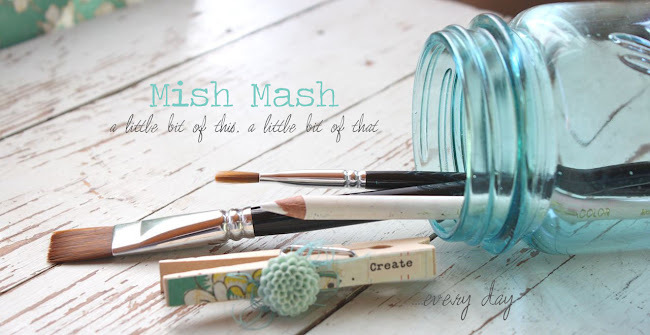 If you need a little inspiration on how you can use Washi tape on your projects, check out this awesome post by Lisa Truesdell for Two Peas In A Bucket. 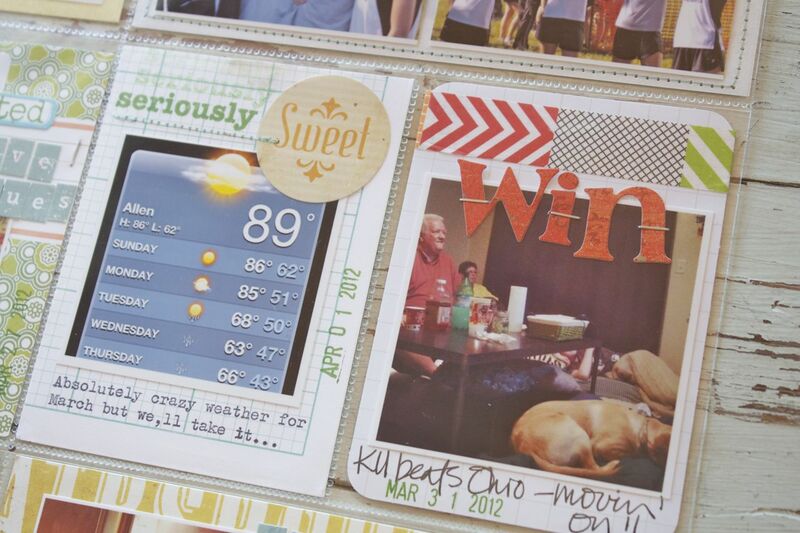 She shows us 18 ways to use Washi tape! 1. Leave a comment on this post with your name and a direct link to a favorite project using Washi tape. It can be your project or a project you find online. 2. I will select a winner on Monday morning and will post here on the blog shortly after. 3. 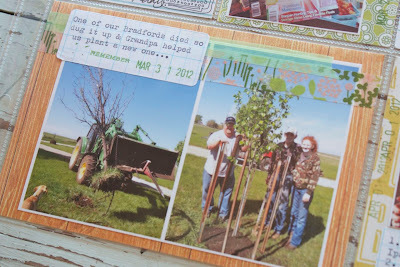 Comments posted on this blog post will be eligible for prize until Monday, April 23rd til 6am CST. We've had family here since Thursday. The fellas spent their time fishing and hunting while my sister and I stole away one afternoon for a fun day of junkin' and visiting the garden shops. 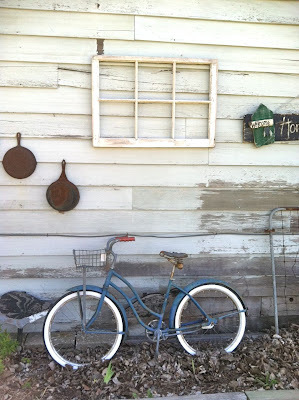 I thought I'd share some fun photos from our junkin' finds. I'll share the floral stuff another day. 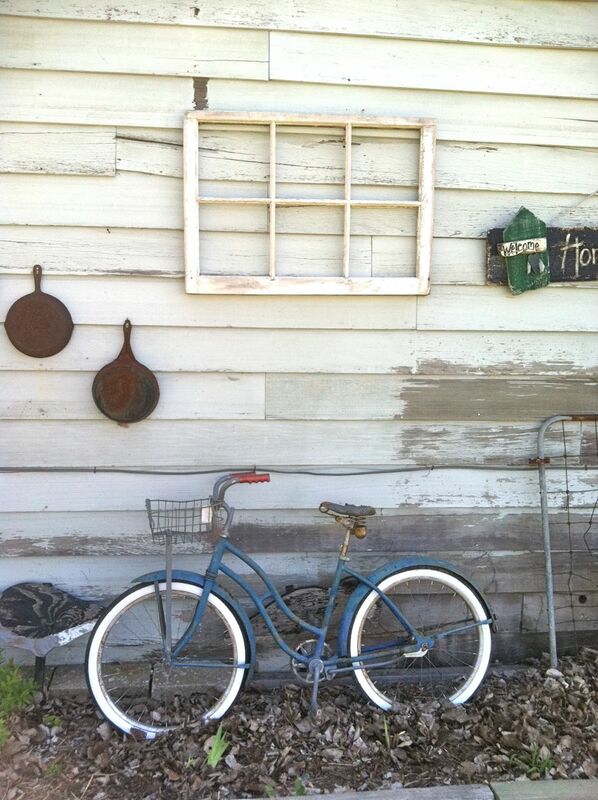 Old bicycles. I'd take every one of them home with me if I could. Especially ones with wire baskets. Fishing boat. 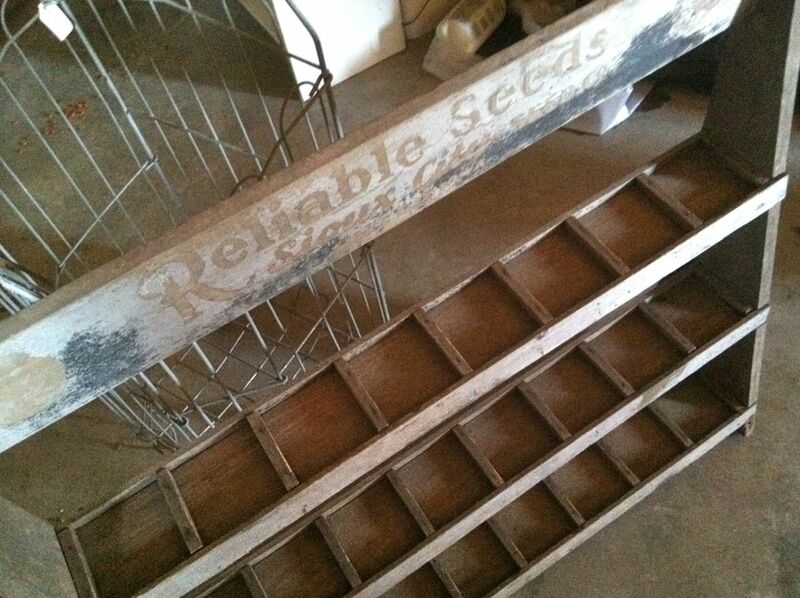 My sister had her eye on this beauty for her husband's man town shed. 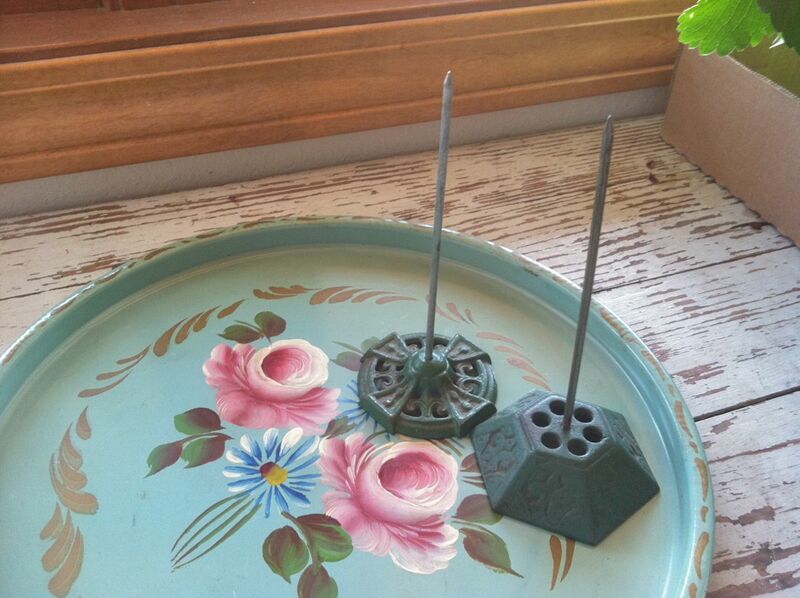 She thought it would be cool to display her antique fishing rods. I thought the old wood seat needed a wool quilt. And check the color, what's not to love? Cute napkin display. 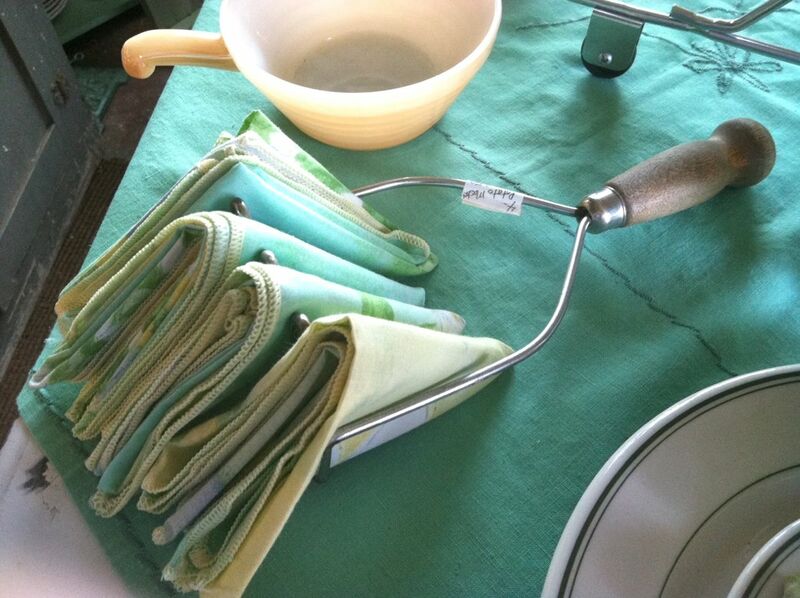 Old potato masher with folded napkins. When we got home I dug out an old one that I had and my sister showed me how to fold napkins into neat interlocking triangles. 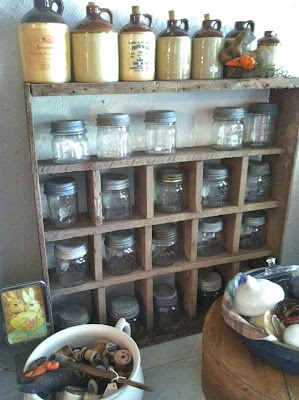 Jars, of course. You know I love the jars. 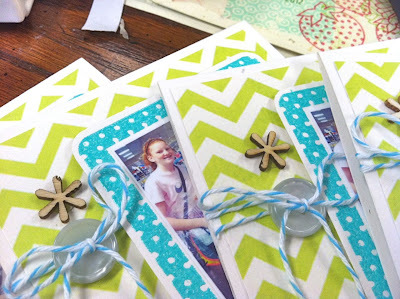 How about these half pints, oh so cute and $5 bucks a pop. 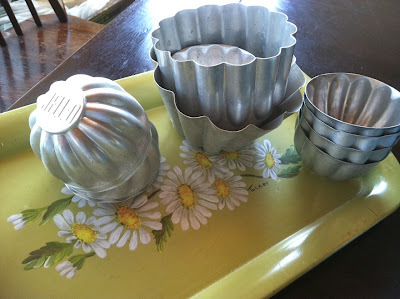 I had a slap your forehead moment....use the zinc lids for smaller jars too. Duh. 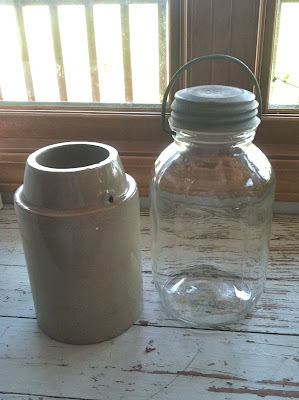 Crock + canning jar. I did come home with these. 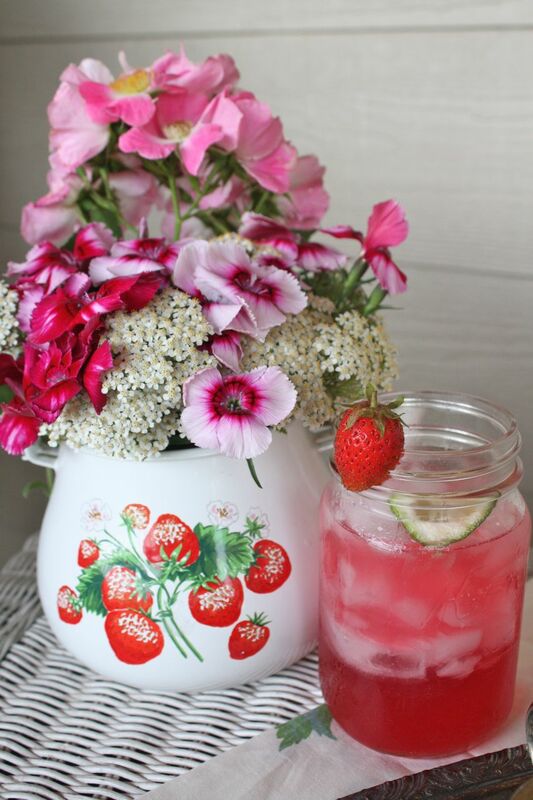 I'll use the crock for wildflowers on the porch. Nice and heavy so the wind won't blow it over. And an old canning jar with a handle. I might use this for iced tea in the summer. Or lemonade. Perhaps a margi. Cameras. Two old Kodaks. 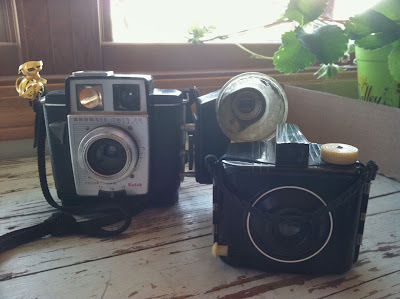 I finally caved on vintage cameras. These were priced so well that I couldn't resist. Wish the big one had a bulb in it still. My goal is to have a shelf with family photos and these cameras. We'll see when that gets done. Painted tray + tin molds. A little something for you guys. These will be transformed into an "instant collection" item for the shop. 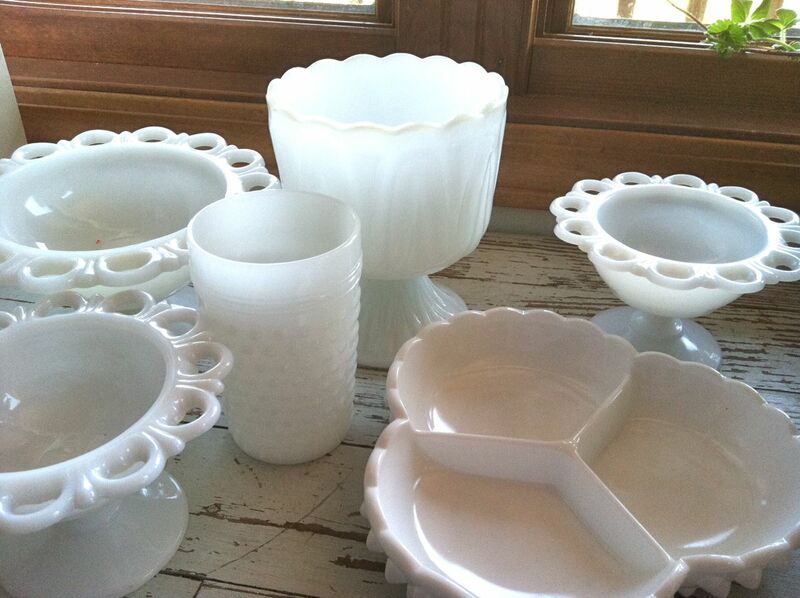 Milk glass. So pretty. I scored a few that will also become "instant collections" for the shop. Unless of course I keep a few for the Craft Department. The 3 scalloped pieces were all purchased at separate places. How cool that I found three of the same style. Painted tray + receipt spikes. The tray is just my color and it matches a little planter I use to hold my markers. It's like they were meant to be together. I'll snap a photo of them together. 2 more receipt spikes at a good price. I saw lots more but they were $15 and up. No thanks, I have my limit people. Drum roll please. This was the best find of the day. It's a seed packet display unit from the Reliable Seeds Company in Sioux City, Iowa. Love the branding even though it's worn. I have a plan for this brewing in my little brain. My sister wanted it too. But I saw it first. Back in 2010 we decided to plant strawberries. I bought some puny roots and got a few starts from my neighbor. I was so excited to have a strawberry patch. But alas, the deer ate and trampled my strawberries, the weeds took over and the husband tilled up my patch. No more strawberries for us. But this was our bumper crop from that summer. It was a joyous day when the reds picked this small bowl full. So much so, we decided to have a party. Jordan was the party hostess. 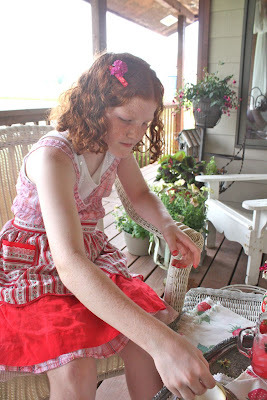 She made invitations, made decorations, wore a cute dress and vintage apron, cut wild flowers from the field next to our house.....it was a strawberry porch party in the making. And it was one of the most adorable moments in my life. 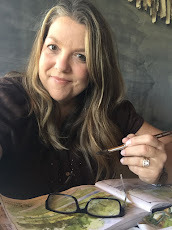 You can read my original post about this day right here. The flowers were tucked into a favorite vintage tea pot. 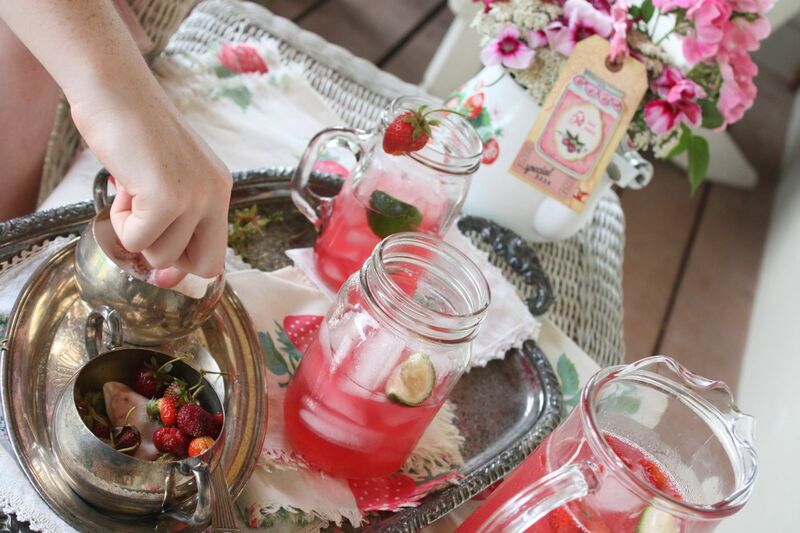 We prepared Cranberry Lime Coolers, the most refreshing drink ever. You can find the recipe in this post. We used a silver tray, a silver cream and sugar set, vintage linens and mason jars to serve our fresh strawberries and Cranberry Lime Coolers. 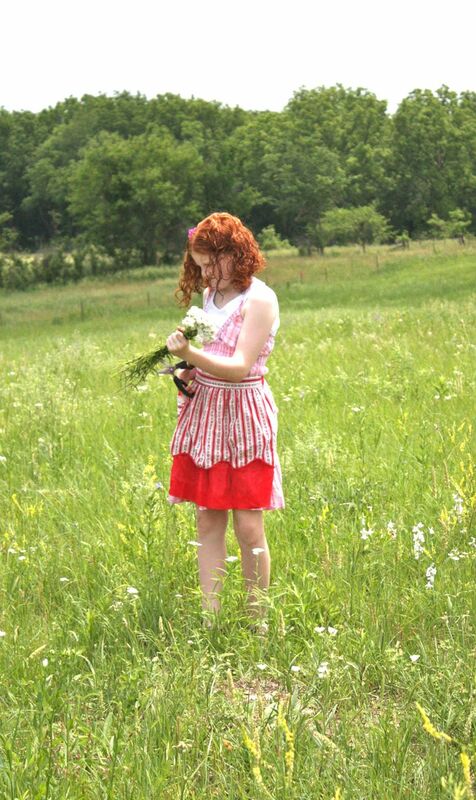 And she had the sweetest, freckled face I've ever seen. With little bouncy red curls. 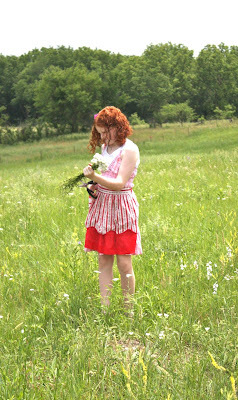 And a hand picked flower in her hair. She made sure every little detail was just perfect. 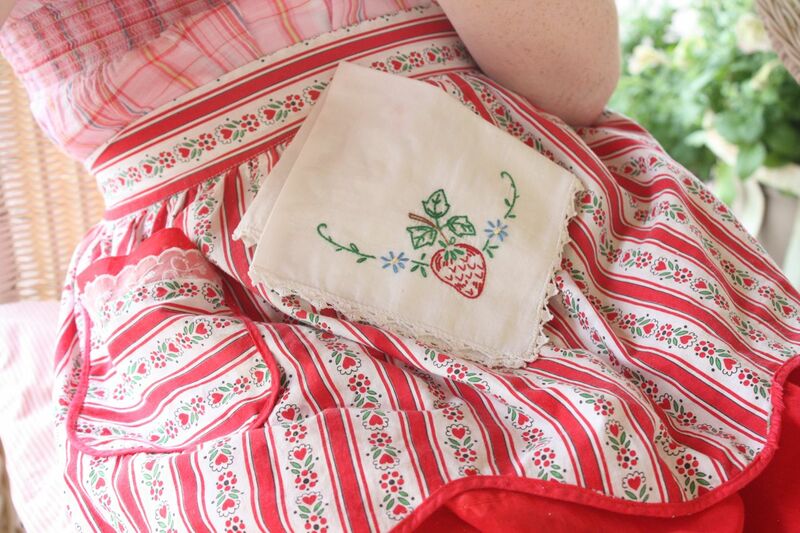 Sweetness in a little red apron. 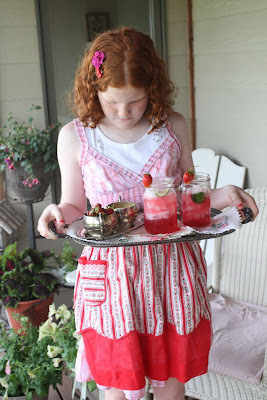 And we enjoyed our strawberry porch party. Just sittin' there like it was the only place we had to be. The best place to be. 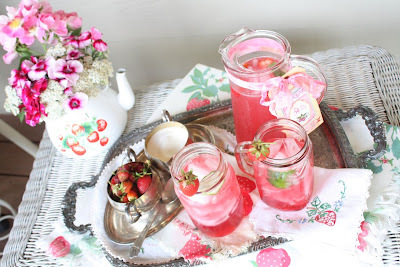 We dipped strawberries in sweet sugar and drank our drinks from mason jars. Nothing fancy but it was a real treat. And such a little lady on that day with a vintage strawberry embroidered napkin in her lap. I hope I never for the sweet memories from this day. 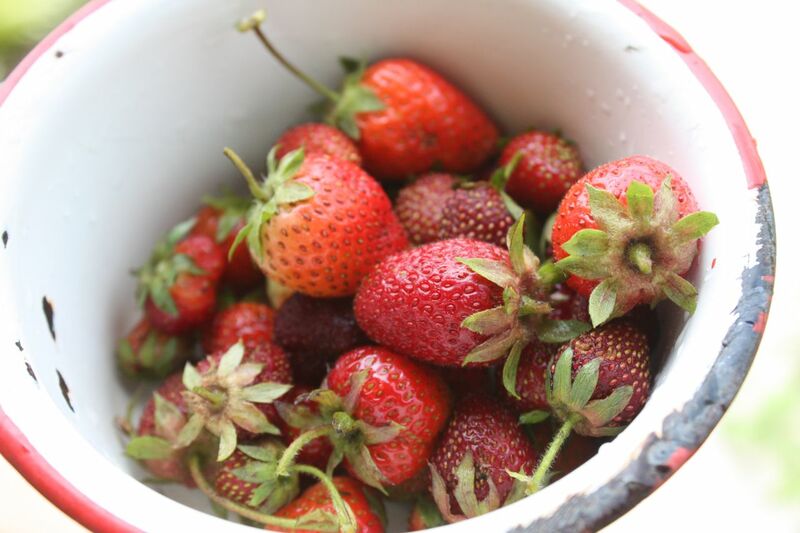 And the love of strawberries continues today. This month Nichole and I introduced Strawberry Patch & Sentiments at Papertrey Ink. 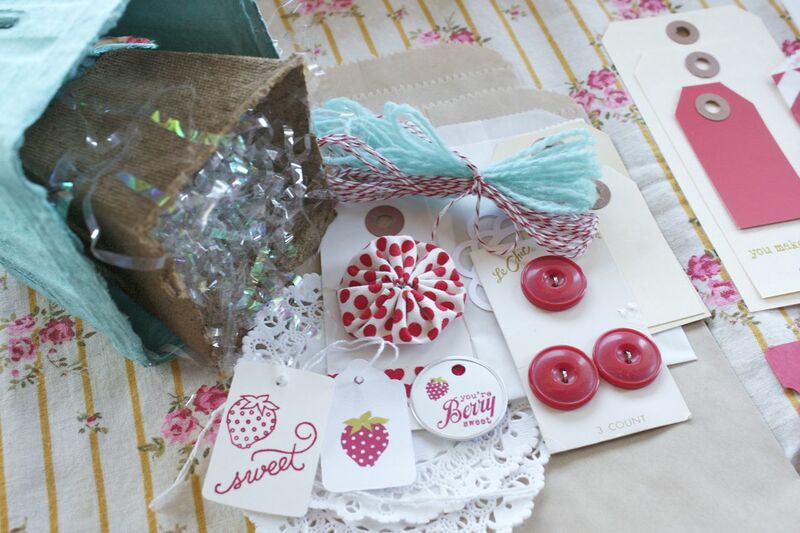 You might notice that some other sets Nichole and I designed contain strawberries too. Vintage Picnic has a little strawberry image. And Friendship Jar Summer Fillers has some fun strawberry images along with a sweet sentiment. 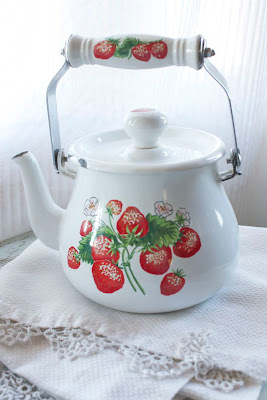 And this sweet vintage tea pot was my inspiration for Strawberry Patch. If you look at the largest image in the set, you'll see the similarities. This tea pot was given to me by my sweet friend Carol in 2007. I keep the note she wrote to me tucked in the tea pot. 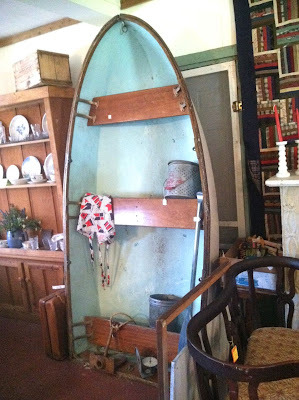 There's nothing better than a fun vintage find...unless it's given to you by a sweet friend. 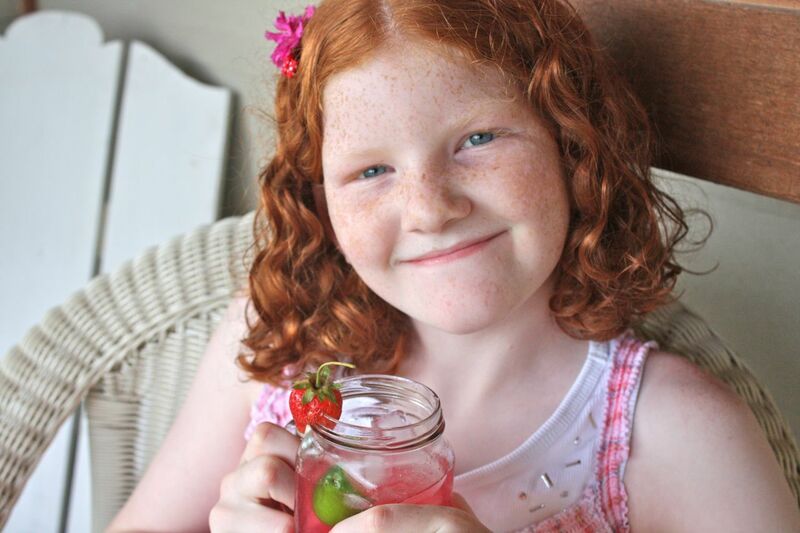 And look what else I found tucked inside.....the sweet little invitations that Jordan made for our strawberry porch party. 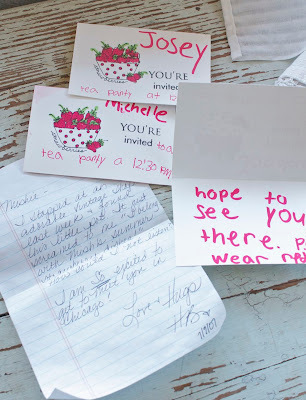 I love her little handwriting....and that we were to wear red. So many fun memories. It just makes me want to stamp up strawberry cards and send them to everyone I know! And I do have a little something special to celebrate my new stamp set. There's a fun new kit called Strawberry Love in my shop. I'll be showing a few ideas on the blog this month made with items from the kit.